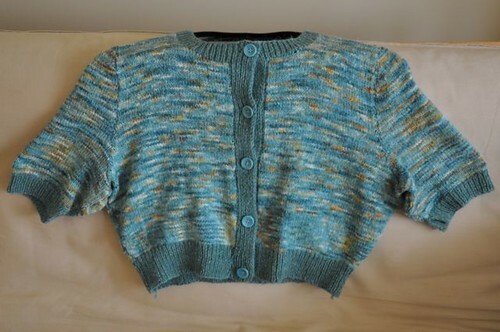 After a lot of seaming work and sewing in countless ends, I have a completed cardigan, slightly cropped in length. The sleeves are a bit tighter than I’d like but it fits well. I’ve never got gauge on the needles specified in the pattern before, and it happened on an English pattern. This was a Rowan freebie pattern but they’ve since taken it back and it’s only available in book form now. The main yarn is special because I got it during my only trip to Maryland for the Sheep and Wool Festival. The yarn company, DZined, is gone now, and I wasn’t sure I had enough to get things done, so the ribbing is in Peace Fleece Kamchatka Sea Moss. Seaming took forever. I did the shoulders twice because the first time looked bad, then there was the button band and buttonhole band to attach, then attaching the sleeves to the body, then doing the side seams, and finally sewing on the buttons. I love how the shoulders turned out. This shoulder style suits me much better than raglan sleeves so I’ll be picking future tops to avoid the raglans. Amelia is off my queue, and Deco is my next big project. Part of the reason I delayed the seaming was because I was worried the sleeves wouldn’t fit me. I don’t have twig-thin arms, I have the arms you get from being a bit overweight and then doing three years of weekly punching drills. It turned out the ribbing on the sleeves was a little tight, so I left that part unsewn and it worked out OK. It loosened up a little when I washed it, because it was blocked in a most unusual (and non-washed) way. This is the first piece I’ve made where the pattern told me to press the pieces before sewing. That’s press as in steam iron. And it worked, I was shocked how well it worked and I’m wondering about steam-pressing a lace scarf. I happen to have a lace scarf in progress too, Flutter in an alpaca/silk 70/30 blend laceweight. I love the colors! Looks like a very versatile little sweater, and a perfect fiber-festival remembrance. Pretty! I love the random pattern. The coordinating solid ribbing works really well.